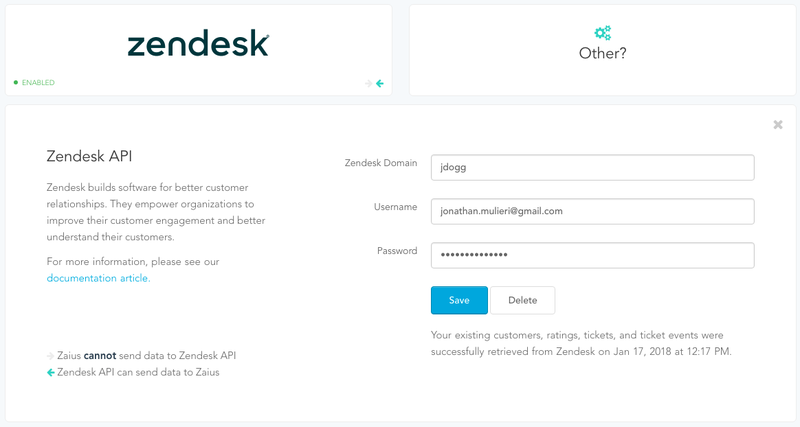 Bring customers, satisfaction ratings, tickets and ticket events from Zendesk into Zaius. IMPORTANT NOTICE: You must be an administrator within Zendesk to successfully integrate with Zaius via username and password authentication. See Zendesk for more information or setup an API token and provide that to Zaius instead. When you setup the Zendesk integration, your customers, satisfaction ratings, tickets and ticket events are imported into Zaius.